The Rev. Lorenzo Lebrija has been named Chief Development Officer for the Episcopal Diocese of Los Angeles, effective January 1, 2018. As a member of the bishop’s senior staff, he will also work closely with the ongoing stewardship efforts for the congregations of the Diocese. 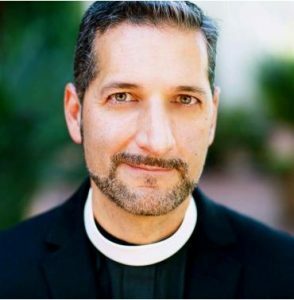 Lebrija is currently the bishop’s officer for development, as well as pastor to St. John’s Episcopal Church in San Bernardino, CA, where his final mass will be Christmas Eve. Prior to entering seminary Lebrija was president and CEO of Seraphic Fire & Firebird Chamber Orchestra, Miami’s professional choral and orchestral ensemble. Before that he was the program director in Miami for the John S. and James L. Knight Foundation responsible for a substantial grant portfolio and the launch of the Knight Arts Challenge. He is a non-executive advisory board member at Purple Arrow Marketing in New York City, specializing in advertising and media relations. Having been General Manager for Radioactiva Hispanic Radio, as well as Editor/Director of Operations for Miami’s Community Newspapers, Lebrija has vast experience in media marketing. He has been a frequent speaker at community groups on community involvement, the arts, business strategy and marketing. Beyond his MDiv from General, Lebrija also has an MBA and a B.A. from Florida International University, has completed the full training at the Fundraising School at Indiana University, and is a graduate of Rice University’s Executive Education Program.